The Final Frontier is the 15th studio album by the legendary heavy metal band Iron Maiden. Maiden have gone through their fair share of development and growing through the years, but in the last few years they seemed very much content to sit on their laurels and produce one colourless album after another. It was Maiden, so it was still good to very good, but it was also devoid of life or heart. It was as if the guys were merely going through the motions and hoping the fans wouldn't notice that they were selling us the same stuff they had been putting out 20+ years ago. Their last effort, The Final Frontier, is no great departure in that respect. The lads are still mostly content on selling us ideas that may have been fresh once, but are now just metal stereotypes that most pimple-faced youngsters with good guitar skills could come up with. Yes, Maiden have become their own cover band. That wouldn't be so bad on its own, but up to The Final Frontier there seems to have been no more energy and elation in their music. This has, at least in some degree, taken a turn for the better. The album does indeed provide for some actual conviction and joy in the writing. They had to cover up the lack of ideas on previous albums with prolonged chorus repeats, while hear they don't need to resort to such cheap tricks. The writing, as I have mentioned, isn't ground-breaking, but it's still full of some spark that's been missing for quite a while. Songs like Satellite 15, Starblind, The Alchemist, Isle Of Avalon and The Man Who Would Be King include some quite inspired segments (inspired is a word I thought I'd never again use in regards to Iron Maiden). The problem with this album is that the ordinary and stereotypical parts greatly outnumber the trully sublime ones. Again I'm wondering if it might not have been better to cut the album to about 40 minutes. That would make it a much more fetching concept. 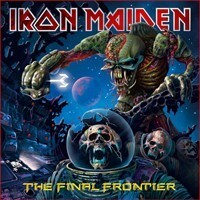 The Final Frontier is definitely an improvement over just about anything Maiden have done since Seventh Son, but it's not an album that can stand alongside classics like Seventh Son, Fear of the Dark, Somewhere in Time, Killers or Powerslave. There are moments that have immense potential, but they are too few or don't last long enough. Still, if you’ve enjoyed their last few albums, this one should provide you with even more satisfaction.